Last night we got all dressed up and went to the Cornwall Tourism Awards ceremony (check out Farmer Dave looking super smart in his suit!). We heard a few weeks ago that we’d reached the final, but whether we would achieve bronze, silver or gold remained a closely guarded secret – until last night. 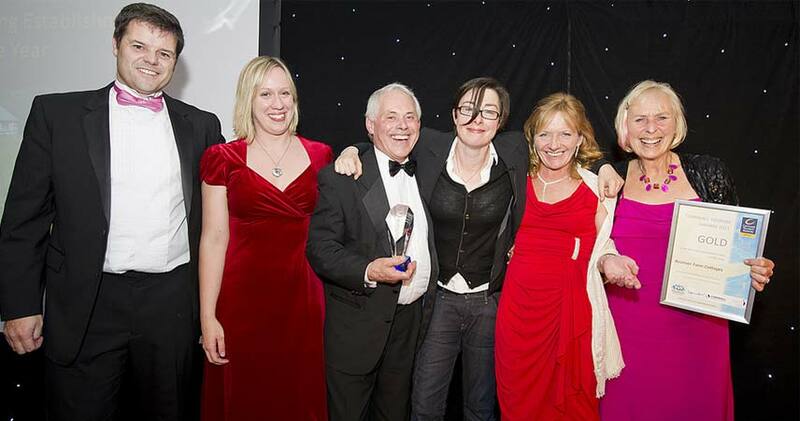 Held at the St Mellion International Resort, we were greeted with glasses of champagne on arrival before sitting down to a delectable dinner and the comic talents of Sue Perkins (much to Helen’s delight, as Sue’s one of her all-time favourite TV personalities). Sue’s humorous observational comedy was, naturally, Cornwall-themed, and she had us all laughing out loud within seconds. We were thrilled to be awarded Gold in the Large Self Catering Establishment of the Year and Silver in the Sustainable Tourism category. So we now have two lovely shiny new trophies in the office (come and have a look when you’re next down at Bosinver). On a more serious note, these awards are recognition of all the hard work the team’s put in. Building our eco-house, Lowen, was perhaps one of our biggest challenges this year, and we’re utterly delighted with the way it’s turned out (and from what guests who’ve stayed there so far have said, they are too! ).